Given the Parkland School shooting, we have had several clients inquire if we own gun stocks — which given our ownership of broadly diversified indices (Vanguard, DFA, Black Rock, Wisdom Tree, etc. ), was probable. It turns out that a $1 million 70/30 portfolio owns about $300 worth — 0.03% — of gun and ammo stocks. The chart above, via Dave Wilson, could be a case of changing political climate with regards to guns. 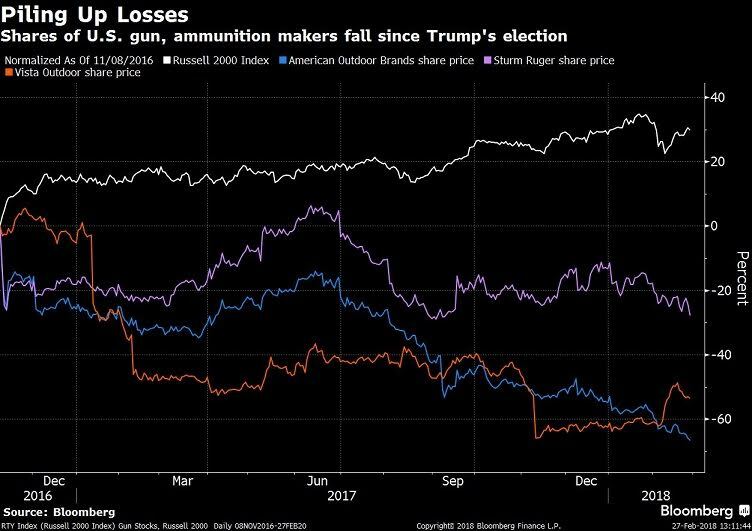 The stocks of gun and ammo makers seem to be reacting very differently over the past year or two than they have during the prior 8 years. Whether it is the lack of a focused anti-gun “villain” like Barrack Obama (?!) to scare more gun sales, something is different this time. Other companies involved in the firearm industry. Olin Corp (OLN) who owns Winchester (ammunition), National Presto Industries (NPK) who owns Nation Defense Corp.
Dave Wilson points out over the same period, the Russell 2000 Index, which includes all three stocks, gained 30 percent.